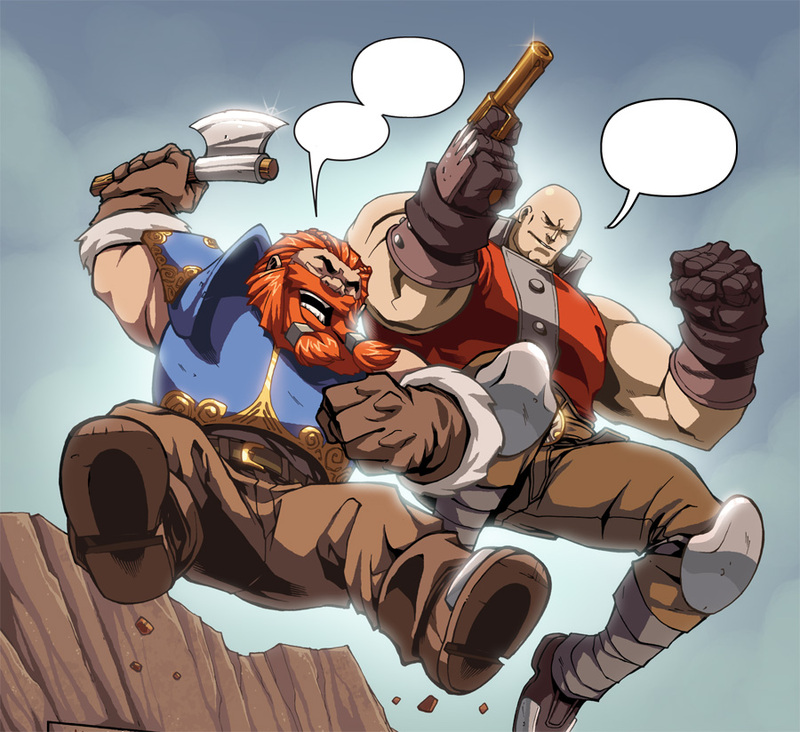 FlamesRising.com is pleased to announce a fun comic caption contest for Skullkickers, an action fantasy comic drawn by Jim Zubkavich that debuted with image comics last fall. We will be giving away a signed copy of the first hardcover collected trade dubbed Skullkickers: 1000 Opas and a Dead Body with an introduction by Robin D. Laws. For those of you who follow Jim’s work, you may recall his artistic and writing style from the popular series of Exalted comics, which are available from UDON. Without further adieu, contest details and rules follow below. Have fun! FlamesRising.com will be giving away one hardcover edition of the Skullkickers comic. Please read the fine print below to find out how you can win! 1. One Entry Per Person – We ask that you post one entry per person, so that your fellow comic fans can have an equal chance of winning a prize. What Will Be Considered – Take a peek at the comic panel below and fill out the bubbles in a comment below this article. Hint: the barbarian on the left is named Shorty; the bald warrior is named Baldy. Only entries posted by midnight CST on Friday, June 10th 2011 will be eligible to win. 4. Valid U.S. Mailing Address Required – Once we’ve contacted you, we will need a valid U.S. mailing address to send you your prize. We will pick up the cost of shipping. If you are located outside of the U.S. and still wish to enter the contest, we will make arrangements for an alternate prize that can be delivered digitally. 5. Prizes and Notification – FlamesRising.com will provide one hardcover edition of the Skullkickers Volume 1 comic to one, lucky winner. Based on the number of entries, we may award random prizes for digital comics as well. Contest winners will be notified via email within one week after the contest ends. Good luck! Here’s your panel! So Baldy, tell me again what were doing?! SHORTY: You know what would be sweet? If we happen to land on a horse at the bottom of this fall. BALDY: How about landing on your two feet and not falling on your face like the last time! Shorty (caption 1): I told ’em it wouldn’t be the fall that would kill ’em. Shorty (caption 2): Their fall, anyway. Baldy: We kill it with fire. Shorty: Aye! Ma’ favorite part of goin’ to tha tavern! Baldy: Just once, can’t we pay our tab like normal people? Shorty 1: To infinity…and beyond! Baldy: I think that might be copyrighted. Short 2: Umm…for the Horde? Was the winner of the caption contest announced? Yes, we contacted the winner via e-mail last week and have mailed out the prize. Thanks for following up!